Use the JK Alpha CB Antenna Mount to easily mount a CB antenna to the Alpha HD Hinged Spare Tire Carrier. Perfect for those not planning on mounting additional components to the tire carrier. • This CB antenna mount can only be used w/out the accessory mount. 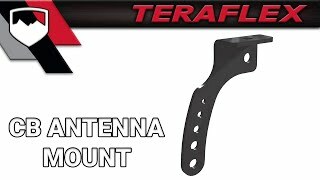 Just another Teraflex product to add to my arsenal. I think I am going to try and use this to mount a camera somehow but have not quite figured it out. Either way you can never go wrong with a Teraflex product.